If you have visited or been past Worcester Park station this week then hopefully you will have noticed the hard work done by the Worcester Park Station Volunteers on Sunday. 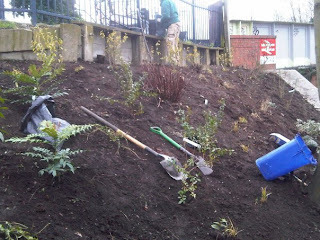 Led by Nick Baum, the volunteers gave up their Sunday morning to weed and plant new plants in the sloping garden next to the steps at Worcester Park station. The plants were bought with donations from several organizations including Waitrose, Kingston Council and South West Trains. Nick Baum, who has been running the volunteer group since September 2009 said he is very pleased with the progress they have made since they first started. Perhaps next time around the good people of Worcester Park could lend more of a hand to these hardy volunteers? There is no shortage of people willing to spend time giving their opinions on their local area via the blog. Can I tempt a few more of you from behind your keyboards to join in and help next time around? The Worcester Park Station Volunteers will be coming out of their winter hibernation and getting back to work this Sunday morning. They will be planting out and generally tidying up the area around Worcester Park Station to improve the environment for the benefit of all residents and visitors to Worcester Park. Please come along and join them at 9am on Sunday 25th March - they are purchasing plants in advance and will be planting them on the day. All helpers will be warmly welcomed - for more information visit the volunteers' Facebook page. A crack team from top retailer M&S will be taking the helm at the Marie Curie Cancer Care charity shop in Worcester Park for one day only this Friday (23rd March). The retailer is sending staff to Marie Curie stores across London to compete against each other to manage, promote and boost sales at the charity shops. The M&S team at the Worcester Park branch will be putting their entrepreneurial skills to the test to attract customers, raise the profile of the shop locally and ultimately boost the shop's takings for the day. The event will feature special M&S food tastings and product giveaways, and visitors to the charity shop on Friday can be in with a chance of winning a brand new sofa and a range of summer and kitchen accessories. And as an extra thank you, customers will receive a free bunch of flowers or some tasty Easter treats for every £15 they spend at the charity shop. The teams across London will be judged on the percentage sales increase in each shop and how they have marketed the store. The event runs this Friday from 9am to 4.30pm at the Marie Curie Cancer Care charity shop on Central Road (next to WH Smith). An full scale search operation was launched in Worcester Park last night after fears that a child had fallen into a lake. Emergency services rushed to The Hamptons after reports that a boy had been seen in the water just before 6.30pm. The police, fire brigade and ambulance service were assisted by the Metropolitan Police Air Support Unit helicopter which was drafted in to help with the search. The operation was called off after the missing boy turned up safe and well at home. Scenes of widespread joy and jubilation on the streets of Worcester Park have greeted the news that Prospects Recruitment on Central Road have finally fixed their doorbell. 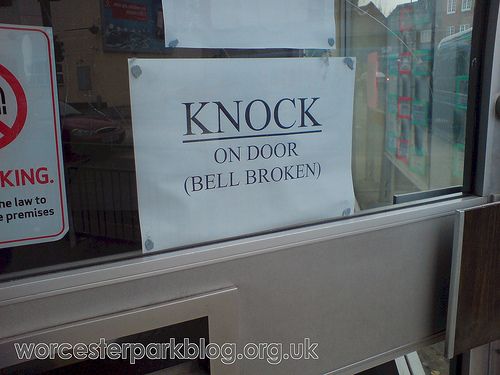 Locals have been instructed to 'KNOCK on door (bell broken) for more than seven years, with most giving up hope of ever seeing it fixed in their lifetime. 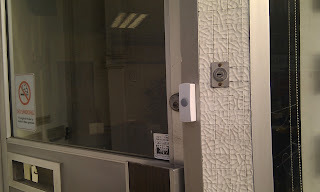 "A Liberal Democrat Councillor was elected in Worcester Park Ward and just weeks later this doorbell is fixed. That cannot be a coincidence." Some blog readers however have been swift in their condemnation of the new doorbell: "How dare somebody do something good and fix something that has been broken." ranted one reader. "It really does make me question their motives. 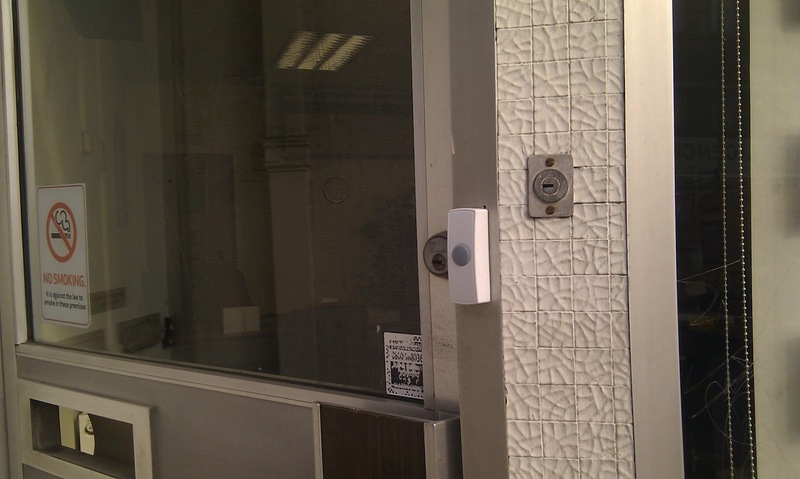 Once again, doorbells within a mile of The Hamptons are getting preferential treatment.". Another blog reader complained: "I wouldn't mind betting that those bloody Scouts are behind this. They're always doing things to improve the area and help people. Now the Worcester Park Baptist Church are getting in on the act. This has to stop. It really does make me question their motives." Worcester Park Baptist Church is inviting volunteers to help with with their project to spruce up the open space at the end of The Avenue over the course of the next two Saturdays. Kingston Council laid a new path in February and arranged for the debris on the land to be cleared and for the grassed area which had been damaged by recent civil contract works to be topsoiled and seeded. The church's part in this community outreach project, whose strapline is 'God loves you enough to die for you' will be cutting back the trees and restoring the flower beds near the traffic lights and generally tidying up the area (pictured). The work is planned for the mornings of Saturday 10th and Saturday 17th March and anyone who wants to pop along and lend a hand is welcome. The volunteers will be planting evergreen and colourful shrubs - and daffodils of course, which they hope will be in flower for Easter. The newly revamped site will then be used during the Easter weekend celebrations - Good Friday to Easter Sunday, 6th to 8th April. ""We wanted to show and share God's love with folk in the local community in a very practical way and partner with others. 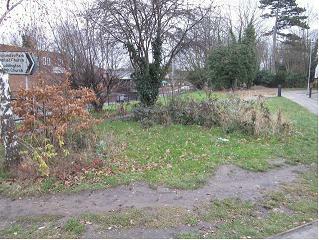 So we came up with the idea of restoring the open space at the end of The Avenue which had become a bit of an eyesore. " Local residents are again being warned about the dangers of rogue traders after a 90-year-old Worcester Park woman who lives alone was conned out of £22,200 by bogus builders. The woman, who is recovering from a hip operation, paid several demands for money before refusing to pay any more. Police were alerted after her neighbours found out what was going on. The victim received a call at her front door on Friday February 24th at around 17.00hrs. The male caller said he was working on the property opposite her and noticed the roof of her semi-detached house needed repairing. After climbing a ladder for a closer look, he reported that the repair would cost £2,700. A few days later, a different man telephoned her asking for a further £4,800 to hire expensive equipment for the work. He wanted cash and asked the woman not to tell the bank it was for building repairs. An further £4,800 was requested over the phone to meet the insurance costs of leaving the equipment on site. During the next telephone call, the resident said she didn’t want the work carried out and wanted a refund. She was told that she would be refunded by bankers draft but this would cost an extra £5,000. The resident believes that she paid a further £4,900 at some stage during the visits and telephone calls. All these payments were collected. The suspects’ vehicle was described as a silver van with the letters ‘B R’ on the side. 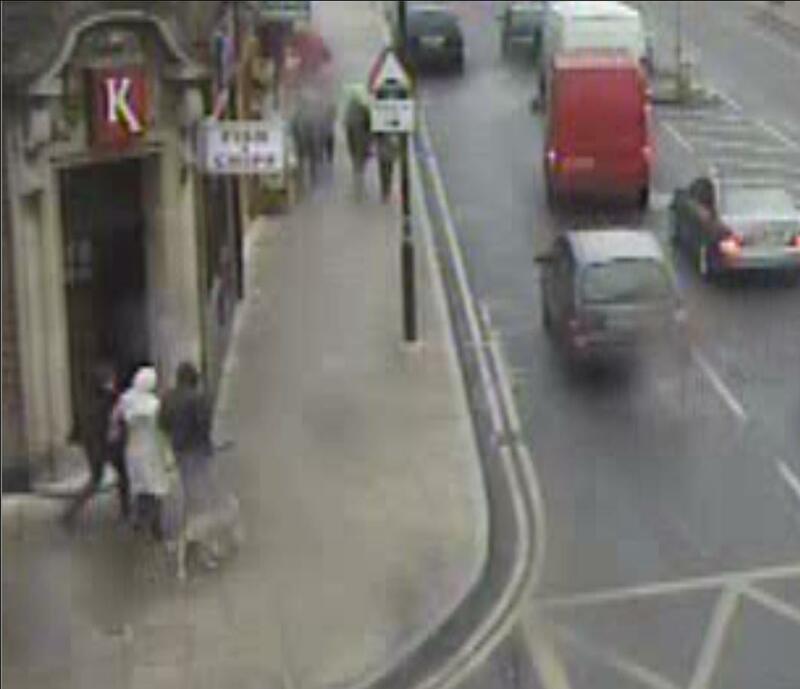 Police are urging anyone who may have seen this vehicle to contact Sutton Police station by dialling 101. PC Duncan Harris, of Sutton’s Crime Prevention Team, said residents should refuse entry, and refuse to pay money, to any unknown and unexpected callers and should not do any business with unsolicited tradespeople who call at the door. Sutton Council run a Safer Sutton Trader Scheme to help residents employ workmen and be confident that certain standards will be met. For details visit: www.sutton.gov.uk and click on Safer Sutton Trader Scheme under ‘Useful Links’. Alternatively, call 020 8770 5070. 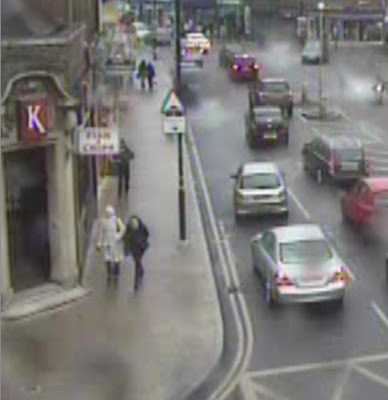 Police officers would like to speak to the two women in these CCTV images in connection with the theft of a handbag from a 77-year-old female customer in Iceland in Central Road, Worcester Park on Wednesday 8th February at around 13.20 hrs. The handbag had been in the customer's personal shopping trolley but the handbag was missing by the time she arrived at the checkout. The individuals in these photos may not be connected with the offence and may be innocent. These momentary power cuts are causing much consternation in Worcester Park - twice causing Mrs WP to jump out of her seat with fright and ruining Sunday night telly (never realised how long a Virgin Media box takes to reset itself). The power problems seem to be affecting a large area - from the bottom of Central Road all the way up to North Cheam and beyond, with one Twitter user reporting having no water since the power outage. Candles at the ready everyone! The 4th Worcester Park Scouts (funny how you never hear about the first, second and third) will be holding their first auction of the year on Saturday 10th March at their headquarters in Braemar Road. Viewing starts at 1:30pm, with the auction commencing at 2:30pm (admission is 50p). If you have any items for sale (no clothing, TV's or gas appliances) bring your lots down for auction between 10am and 11.30am. There is a catalogue listing fee of 20p and the Scouts retain one-third of the selling price (up to a maximum of £10). 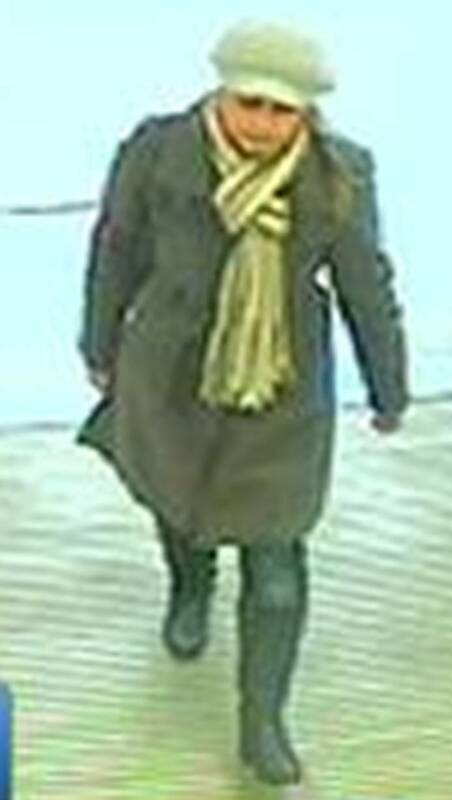 Police are appealing for help identifying any of the individuals in these images after a 62 year old man was bitten on the back of the leg by a Staffordshire type dog in Central Road on Saturday 18th February at 14.20 hrs. The victim was walking up from Worcester Park train station to meet his wife for a coffee after attending a volunteer meeting for the Olympic Games in London. As he passed HSBC bank he was bitten through his jeans by the dog which was on a lead at the time. The victim was taken by his wife to St Helier Hospital where he received six stitches. 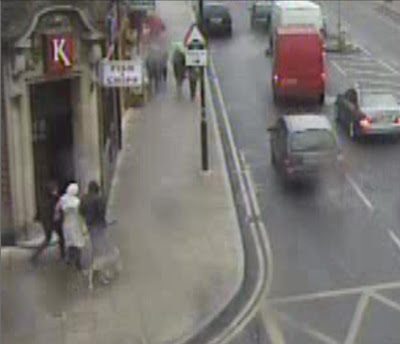 The individuals in these images may not be connected with the offence and may be innocent. 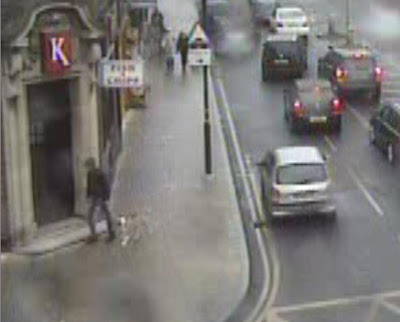 If you can identify any of individuals in these CCTV images (from the junction of Central Road and Green Lane) please contact PC Luke Lazell at Worcester Park Safer Neighbourhoods Team on 020 8649 3590. Alternatively, you can contact Crimestoppers anonymously on 0800 555 111.